Chicken Cordon Bleu is a French-inspired poultry dish, although evidence suggests that Chicken Cordon Bleu was actually developed in the United States by chefs imitating other stuffed meat dishes from Europe. The name of the dish is clearly of French origin – Cordon Bleu means “blue ribbon” in French, and in French culinary tradition, the Cordon Bleu is awarded to food or chefs of particularly high quality. More information please check Wisegeek out. Preheat the oven to 180C/350F. Combine the chicken broth, melted butter and minced garlic in a bowl. Set aside. In another bowl, mix together the breadcrumbs, Parmigiano-Reggiano, and paprika. Place each chicken breast between 2 sheets of heavy-duty plastic wrap, and pound each to 1/4-inch thickness using a meat mallet or rolling pin. Sprinkle both sides of chicken with salt, pepper and oregano. Place a cheese and ham slice on each breast within 1/2 inch of the edges. Tuck in the sides of the breast and roll up tight like a jellyroll and secure with toothpicks. Dip each roll in chicken broth mixture and dredge in breadcrumb mixture. Place rolls, seam side down, in a baking dish coated with butter. Pour the remaining broth mixture over chicken. Bake in the preheated oven for 28 minutes or until golden crisp. Nothing fancy. Just an ordinary but very delectable white fish and tomato sauce for pasta that works perfectly as a one-course meal. Rinse and dry the fish fillet. Sprinkle both sides lightly with salt and pepper. Bring a large pot of salted water to a boil. Add the spaghetti to the boiling water and cook until tender, yet al dente, about 8 minutes. In a large saucepan over low heat, gently sauté the garlic in olive oil until aromatic. Add in chopped anchovy, stirring briefly, then add in chopped onion and stir until softened. Stir in capers, olives, chilli flakes, and the parsley. Then pour in the white wine and cook until it reduces a bit. Now add in the tomatoes and bring the mixture to a boil. Put the fish into the saucepan, covering with the sauce. Cook 15 minutes until it is cooked through. Flake the fish and continue to cook briefly. Drain the spaghetti and add to the sauce. Look for a different omelette recipe for the breakfast? Zucchini Omelettes are healthy, delicious, and simple to make. Use smoked salmon, or cheese instead if you have no leftover Milanese chicken in the fridge that needs to be used up. Beat eggs and water in a bowl. Mix in grated zucchini and season with salt and pepper. Heat the oil in a small, non-stick skillet. When hot, add half the egg mixture and cook for 1 minute until the egg begins to set. Scatter evenly with half diced chicken. Cook for a further 1-2 minutes, until the egg is golden underneath, and just set on top. Slide out onto a serving plate, folding it over as you go. Repeat. Serve the omelette with your favourite salad. Buckwheat is loaded with nutrients and has an unique nutty earthy flavour. In addition, buckwheat flour is gluten free, leading people with gluten intolerance to seek it out as a flour alternative. Inclusion of buckwheat flour will also make a dish more nutritious, since buckwheat is high in fiber(which offers significant protection against breast cancer-according to WHFOODS), amino acids, protein, niacin, and vitamin B, among other things. I am sending this to Carol's Gluten Free Photo Contest. Preheat the oven to 160C/320F. Line 3 baking trays with paper. Beat the egg whites and sugar in a mixing bowl until well combined and the sugar are dissolved. Stir in melted butter until combined. Sift in the buckwheat flour and then the almond slices. Fold to combine. Spoon the mixture on the prepared trays. Use the bottom of a tablespoon to spread the mixture until thin and even. Bake in the preheated oven for 15 minutes until golden crisp. Remove and cool completely. If you are looking for some buttery, chewy, soft and mellow cookies, then this is the one for you. These cookies are plainly delicious, especially if you are a fan of cream cheese, which serves as a fanf^ckingtastic catalyst for the rich robust flavour in cookies. Preheat the oven to 150C/300F. Line two baking trays with paper. Finely chop the raisins. Sift together the flour and baking powder. Cream the butter, cream cheese and icing sugar until well blended. Add in egg white and beat until combined. Add in chopped raisins. Mix in the flour mixture. Shape teaspoonfuls of the dough into balls and place them 2cm apart on the prepared trays. Bake for 30 minutes. Then turn the oven off and leave the cookies in for 20 minutes. Remove and cool on a wire rack. Coat the cookies with extra icing sugar. I know what you are thinking now: "zucchini AGAIN?". YEP! I adore fresh seasonal veggies a lot and of course you can get zucchini throughout the year, but the best ones appear during late spring or early summer time. Zucchini has a high water content, so it makes the perfect food for people on diet. Besides that, it contains good amount of vitamin C, and A, both of which are very important and necessary for good health. Rinse and dry the zucchini. Cut both ends off and grate the zucchini into the long thin strips. Place them in a large salad bowl. Whisk together the walnut oil, lemon juice, honey, crushed garlic, poppy seeds, salt and pepper in a bowl. Toss the zucchini strips with the dressing until combined. Serve as soon as possible. There is absolutely nothing better than fresh, warm homemade bread! The smell that fills your kitchen and the taste makes all the effort worthwhile. These savory, satisfying soft bread are just wonderful for a potluck, a picnic, or even your lunch box! God knows how many times I have baked this twisted buns! Add flour, yeast, sugar and salt in the mixing bowl fitted with a dough hook. Add in egg, milk, and water roux. Mix at slow speed for 1 minute until combined. Increase the speed to medium, and continue to mix for 3 minutes until the dough forms. Add in butter mix at slow speed until incorporated. Then increase speed and knead until gluten is fully developed, i. e. elastic, smooth, non-sticky and leave from the sides of your mixing bowl, about 5 minutes. Remove and form the dough into a smooth ball. Place it in a lightly greased bowl, covered with a plastic wrap, and leave in a warm place until dough is double in volume, about an hour. Press the dough down to release gases produced in the fermenting process. 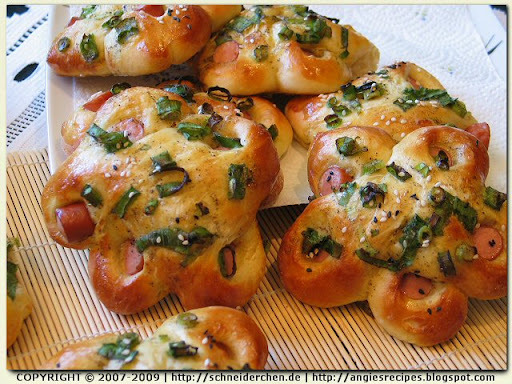 Divide dough into 9 portions, each is about 60-62 grams and round up and rest for 10 minutes at the room temperature. Flatten each dough ball, with seam side down, and roll into a rectangle. The length of the dough should be the same as the sausage you are going to use. 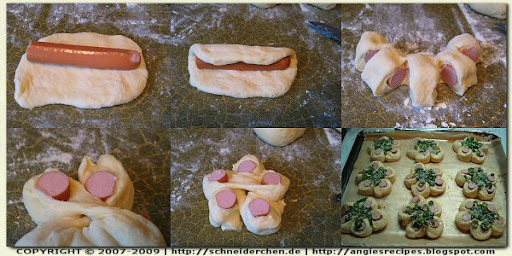 Now turn the seam side up, and place a sausage on the dough. Roll it up and cut into 5 equal portions, but DO NOT cut them through, leaving a thin joint between portions. Cross the first and the last joints, turn the cutting edges of 3 portions over to obtain a flower pattern. Place on a baking tray lined with a baking sheet and cover with a plastic wrapper. Leave to rise for 45-60 minutes. To prepare the topping, mix spring onions, egg (reserve 1 tablespoon for brushing the tops) , olive oil, and black pepper in a bowl. Add the salt in just when you are ready to use it. When the buns have doubled in size, brush them with reserved egg mixture, then place some onion mixture atop. Finally sprinkle with some sesame seeds. Bake in preheated oven at 175C/350F for 15 minutes or until golden brown. When done, turn the buns onto a wire rack and let cool completely.